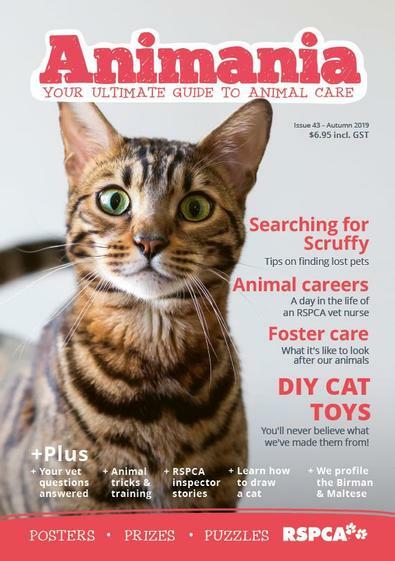 RSPCA’s Animania magazine is your ultimate guide to animal care! Inside this quarterly magazine you’ll find awesome animal stories, breed profiles, mini posters, pet care tips, prizes, puzzles, and much more! For only $25 per year, you’ll receive four issues of Animania magazine delivered to your door. It’s the ideal gift for animal lovers of all ages! Animania Magazine is a quarterly publication. Please allow four to six weeks for your first delivery. Animania is normally printed and distributed in March, June, September and December. Suitable for girls & boys aged 15 and under. A fantastic magazine for a wide range of ages - my kids are 9 and 13 and both look forward to each issue! My kids love this magazine. They learn about different types of animals and how the RSPCA helps them. I love this magazine! I can&apos;t wait to subscribe! It&apos;s awesome because it&apos;s all about animals! My niece absolutely loves this magazine. She is learning all about animal care and the proceeds go to the RSPCA! For quarterly titles please allow up to 4-7 weeks for your first delivery. Your subscription will begin with the next available issue.